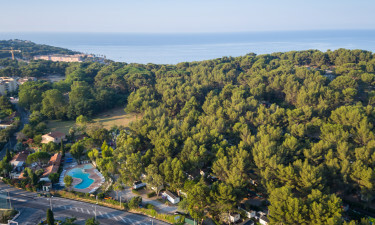 Boasting 163 secluded pitches were guests can enjoy luxury camping in a well-appointed mobile home rented from the LUX-camp, La Presqu'Île is ideal for exploring the beautiful surroundings of Lake Leucate and the bustling resort of Barcarès. 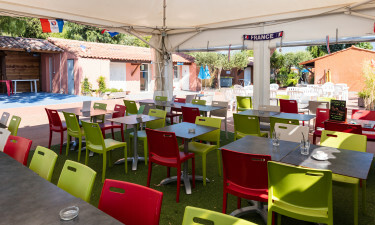 For campers looking for a holiday camping site that will allow them to enjoy beach life, discover what the Mediterranean coast of France has to offer and have a relaxing time under palm trees, La Presqu'Île is the perfect choice. Why visit La Presqu'Île near the Pyrenees and fine sands of Port Port Barcarès? 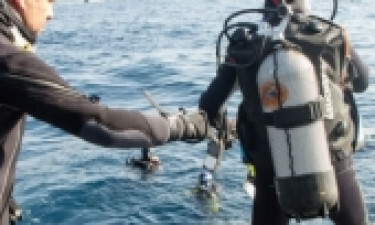 This LUX-camp provides guests with its own onsite restaurant, snack bar and bar, catering for great and small appetites throughout the day and evening. The terrace of the restaurant is converted into a fun place after nightfall, when discos or music shows, quiz evenings or karaoke events can be enjoyed by parents, teenagers and older children. The resort of Port Barcarès is within easy cycling and walking distance, however, camping luxury at La Presqu'Île includes an onsite grocery store that can provide guests with life's little necessities throughout their stay, including freshly baked bread and daily newspaper deliveries. Guests can rent bikes for shopping trips to the nearest village or town or avail themselves of Wi-Fi and Internet services at the holiday camping site to order deliveries for things that might not be stocked in the grocery store during the off-peak season. The luxury camping site boasts its own water park, where guests can enjoy a relaxing swim in the solarium pool or hurtle down water slides with their kids. Excursions into the nearby Pyrenees with car hire or by train a little further afield are also easily arranged: the nearest station is 15 km distance away and served by local buses. Several bike trails allow campers of all ages to explore the luxury holiday campsite's immediate surroundings or visit the beach every day, a short 2 km pedalling distance away. For relaxation, spend time in the Jacuzzi at the heart of the water park, after handing your kids over to the children club's animators. What other camping luxury can guests look forward to during their camping holiday in the Peninsula? Playing water ball or joining water aerobics, reading the daily delivered newspaper while sitting in a shady spot under palm trees or braving the mechanical rodeo, tackling the climbing wall, or trying hamster rollerblading, friendly football matches and fun-packed games evenings! Why not book your camping holiday with La Presqu'Îlenow?